Houses by the ocean always seem to draw me in. 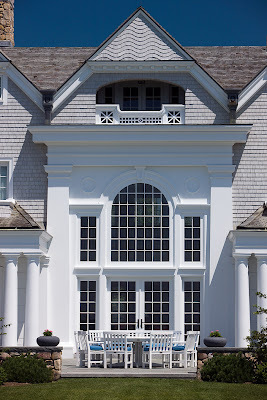 I love the shingle style architecture - and no one does it better than our friends at Catalano Architects. This particular house has incorporated a lighthouse theme. Notice the "lighthouse" in this closer up photo. As usual, no detail was overlooked inside or out. You enter the home via a gorgeous cobblestone edged driveway. The back of the home is breathtaking - designed to take in the equally breathtaking views. Notice the wavy clapboard in the peaks. It would have been easier (and less expensive) to put straight clapboard, but its these small details that add to the character and personality of the home. 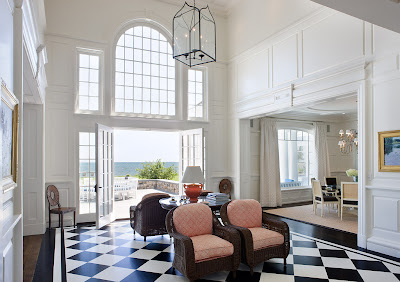 This is the main entry hall - You can see the view through those spectacular windows out toward the ocean. 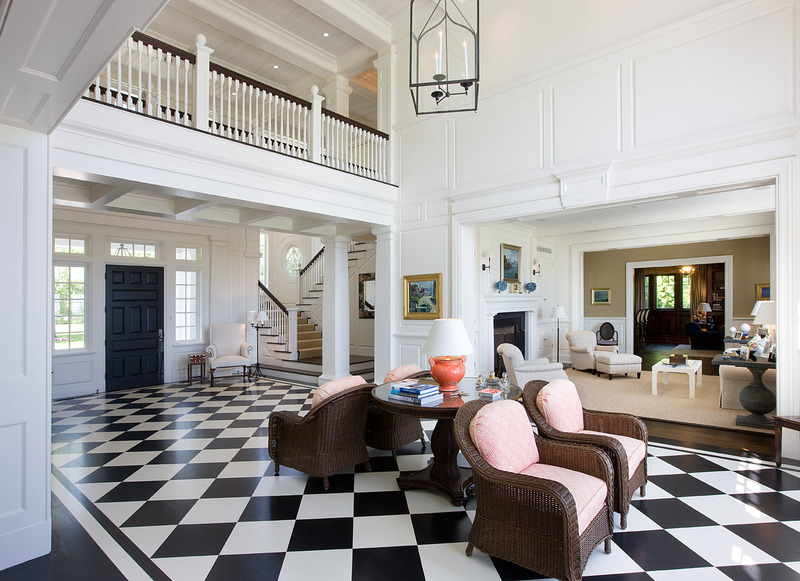 Here is the entry hall with your back to ocean and facing the front door. Notice the tile is set on the diagonal. 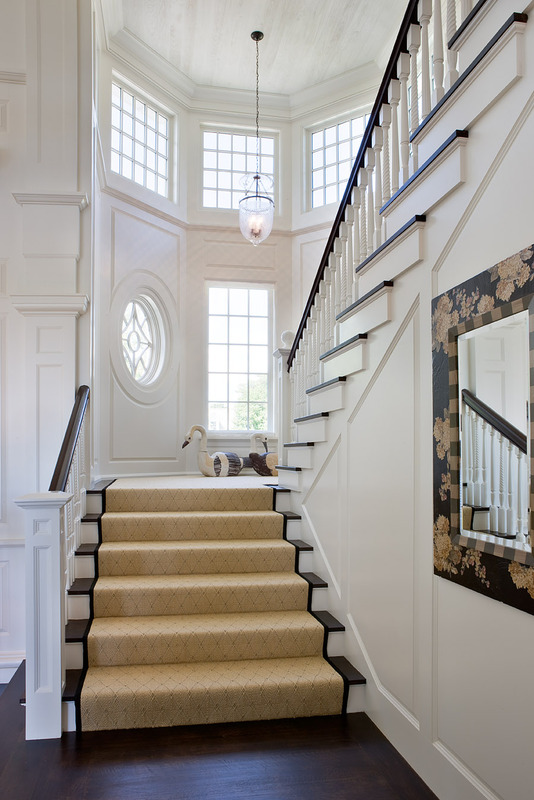 The staircase includes beautiful custom detailing - the moulding, wainscoting and railing. Notice all the window shapes. I also like the stair runner. 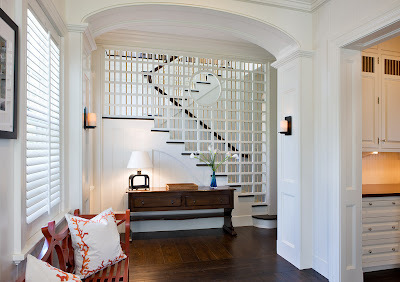 Here the back staircase has a lattice inspired wall. Much more interesting than a solid wall. 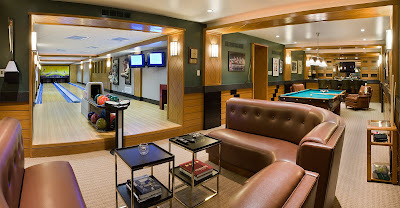 The family room evokes a feeling of being on a luxury yacht. The wood paneled walls are amazing. 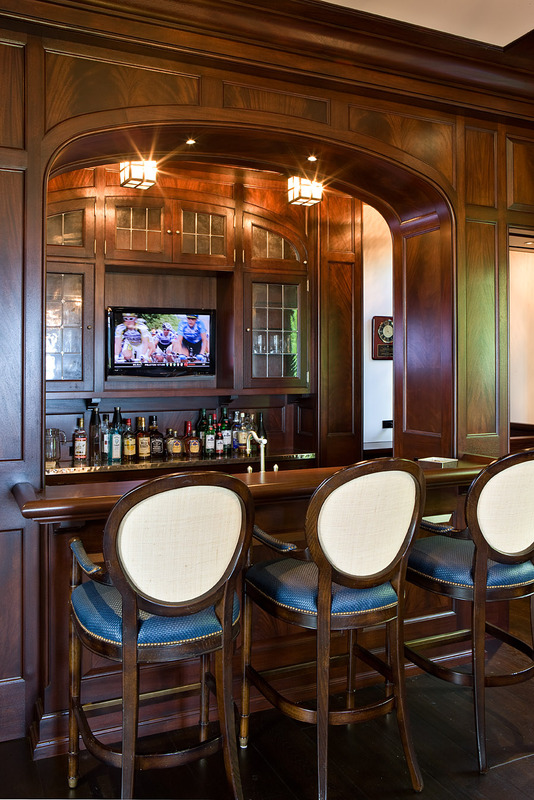 A close up of the bar. Just stunning! The kitchen and breakfast room move us back in the a more traditional coastal decor - white cabinets and beadboard ceilings. Every coastal home needs a pool house/guest house. Again Catalano Architects continues the lighthouse theme and creates a charming oasis. Here is a closer shot. Take a moment and study the outside - the attention to detail is really amazing. Notice the curved shape of the roof, wavy clapboard, railings, columns - This guest house is truly a gem. The inside is also outstanding. I especially love the retractable doors which immediately transform an indoor room into an outdoor room. 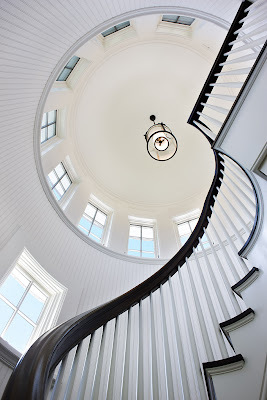 The interior detailing again astounds you - the curved staircase above is a work of art. And when the view and the pool aren't enough - you can enjoy time in the game room, equipped with pool table and two lane bowling alley. Isn't this so much fun??!! 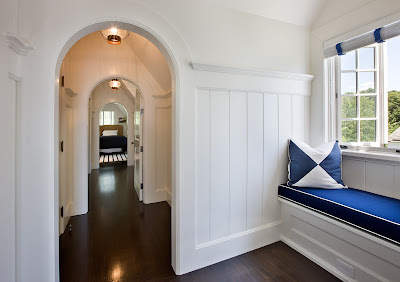 Or find an quiet niche in the house to curl up with a good book. Clearly this home has it all! 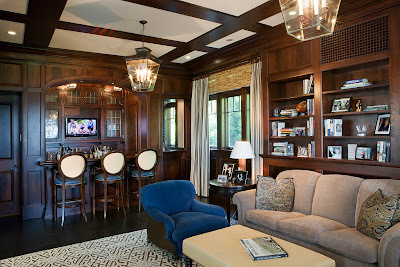 A special thanks to Tom Catalano of Catalano Architects for sharing this outstanding dream home with us! For more inspiration visit Catalano Architects here.